An intense debate over Indigenous rights was part of a court hearing Tuesday for a Nova Scotia company that wants a judge to allow the RCMP to remove protesters camped on the firm's property. Indigenous rights were at the centre of an intense courtroom debate Tuesday as a Nova Scotia company asked a judge to order the RCMP to remove protesters camped on the firm's property. Robert Grant, a lawyer representing Alton Gas, said the camp — established in 2016 — has led to a "combustible situation." "This is a simple case of trespassing on property," he told the court. 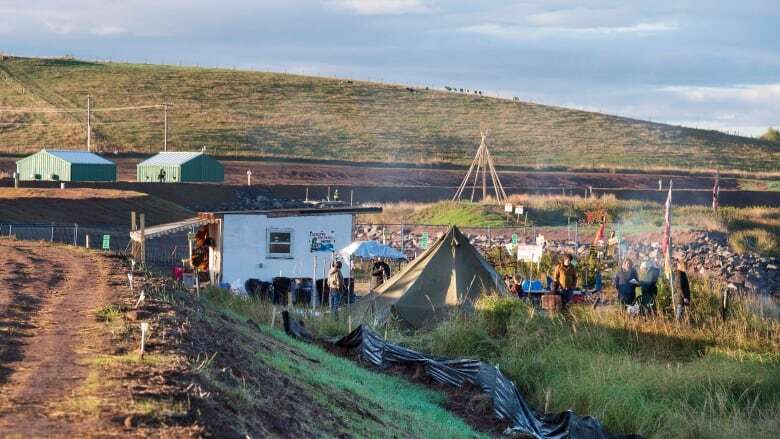 He said the main access road to the company's pumphouse and control centre has been blocked by makeshift structures, including a two-storey mud-and-straw hut, a teepee, a garden and some large rocks. "There have been repeated incidents of impeding ... access," said Grant, noting that Mi'kmaw protester Dale Poulette has occupied the hut for about two years. "He yelled at him and swore at him and physically tried to stop him," Grant said. "The profanity is part of the aggressiveness in these encounters." "Mr. Poulette does not speak on behalf of the Sipekne'katik First Nation," he told the court, which was packed with about 100 spectators. "Mr. Poulette has no authority on his own to assert treaty rights." Court heard that Poulette has been adopted by the nearby band's elders, and was asked to become a "water protector" by a group of "grassroots grandmothers." Alton Gas has argued its representatives have attempted "engagement and discussion" with the protesters, but they say those talks have gone nowhere. James Gunvaldsen Klaassen, a lawyer representing Poulette and protester Rachael Greenland-Smith, argued that Poulette can assert his treaty and Aboriginal rights on behalf of the Sipekne'katik First Nation. While it's true Aboriginal rights are collective rights, there are times when individuals must exercise those rights on behalf of a larger community, he said. "These rights are central to my clients," he said. The Mi'kmaw fisherman's court challenge established that First Nations people on the East Coast had a right to hunt, gather and fish to earn "a moderate livelihood." "This is not a blockade with guns," he said. "And it is not a simple trespass case ... The respondents are not trespassers, they are water protectors appointed by the community." "It is not against the law to swear ... or to express oneself forcefully," he said, adding the company has not suffered irreparable harm. "Alton is not going to be put out of business if this injunction is not granted." Outside the court, protest leader Dorene Bernard said the land in question remains unceded Mi'kmaw territory, and she insisted the protesters have sacred duty to protect the 73-kilometre tidal river. "This is our unceded [Mi'kmaw] land," said Bernard, a social worker, academic and member of the Sipekne'katik First Nation in nearby Indian Brook, N.S. "You are welcome here, but that doesn't mean that you can destroy our water and land ... You cannot put your hand out in reconciliation and then turn around and take something away or destroy something."